and if it doesn't work, it's physics!" Explains Mr. Q, a long time 8th grade science teacher who has a passion for his work and enjoys working with homeschooling families as well. 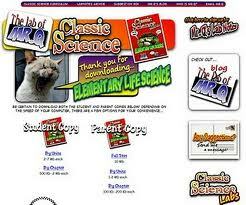 His website ( http://www.eequalsmcq.com/ ) and his blog offer science insights and teaching tips but the most loved link is a free copy of his elementary science book (for ages 6 to 9 ). This download-able eBook is accompanied with a parents' guide which outlines a three day curriculum for each chapter and includes worksheets and activities in addition to those already present in the student's textbook copy. The books can be downloaded as a whole or as separate units. The books have an informal and humorous style yet introduce big words like "environment", "biotic factors" and "population" with simplified definitions and easy to relate examples. The activities are fun and require easily acquired materials. We are using this book for MBAP (8yrs) and IBAP (10 yrs), both boys like to read the text out loud and enjoy the activities as well.